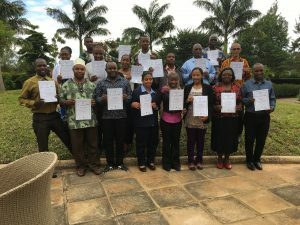 ISTEP Tanzania – Arrived in Tanzania after 30 hours of travel. Arrived to heat, sun, and a beautiful landscape. Did a 4 hr. lay over in Addis Ababa Bole airport. What a lesson in multiculturalism. The most striking for me is the women. Many women in traditional dress and travelling with children. Seems to be a very matriarchal society. Wondered how these traditional women explain to the daughters how women's roles and dress are so very different. Waiting in line, I saw this beautiful little girt with gold shoes. I smiled and gave her a little wave. She continued to look but did not engage. Her mother said it is ok and she held out her little hand so I could shake her hand and she smiled broadly. I said hello and how pretty she was. I told her how much I liked her shoes. She smiled wider. Her mom smiled and acknowledged me. It does not matter if a woman covers her face, it is her choice. Her smile came through her eyes. At Hotel and staff are very friendly. Tired now and going on safari tomorrow. Will write about sunflowers and such tomorrow. 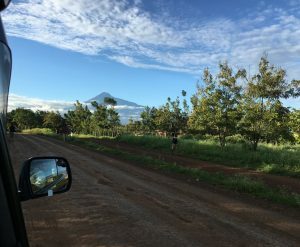 Saturday – The sun is out and the weather is beautiful for our adventure to Arusha National Park. Our guide Emmanuel arrived in his safari rover and off we went. It is hard to know where to begin. The scenery was breath taking. The park is massive and sits at the base of Mount Meru. With nice weather, we could see Mt. Meru throughout the day as we travelled the park. As we drove through the park, we saw Cape buffalo, zebras, wart hogs, Baboons (many baboons) Blue Monkeys, Monkeys, and Giraffes etc. Aussie, our ranger guide took us on a walking safari. As we walked, we got up front and personal with many of the animal residents of the park. Our ranger was equipped to keep us safe and at one point had to ward off a more than curious Cape buffalo. We visited a waterfall carved through volcanic rock and toured the paths and roads on foot. Once back to our vehicle we thanked Aussie and went off for lunch. We climbed up to a picnic spot overlooking Small Momella Lake, a salt-water lake. There we enjoyed lunch, the view, and the sounds of the park. Giraffes could be seen in. The distance eating. Once back on board, we continued on to Large Momella Lake where we saw thousands of flamingos. It was a sea of pink! Watching them take off and fly was comical. Emmanuel wanted us to see elephants. With the recent rains, the elephants would be on higher ground. Up we went winding through the steep roads looking for elephants. No elephants but did see elephant poop. Ce monkeys performed for us from the tress along the road. Jumping from tree to tree. At one point one almost landed on the roof of the vehicle. Heading back to the hotel, we travelled the busy road to Arusha. The markets alongside of the road were teaming with people and motor bikes. It is wedding season and we saw two wedding parties. Cars decorated for the occasion and the wedding party and guests driving through the area led by a band. The band road in the back of the pickup truck playing festival music and bouncing along as the truck drove on. Sunday – Feeling more rested and ready for the next adventure. 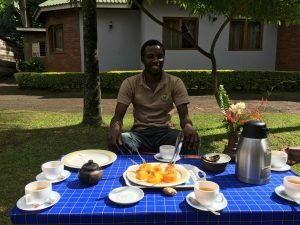 Emmanuel arrives to pick us up and take us to the Tengeru village for our cultural tour and to learn about coffee. After travelling up, up am up a very bumpy and narrow dirt road we arrive. We enter the courtyard and are met by our tour guide Eli Sante. Now I want to take a minute to describe the courtyard. It is like entering your neighbor’s backyard. Beautiful garden, flowering trees, a nice home and covered outdoor space. The yard is fenced by trees and hedges and surrounded by neighbors. Eli Sante invites us to sit at a table set in the yard for us and begins to tell us the story of the Tengeru. Cultural tourism is very important and growing in Tanzania. He points out that while safari is the leading draw to the country, it does not give people a chance to meet local people and get you know Tanzania. 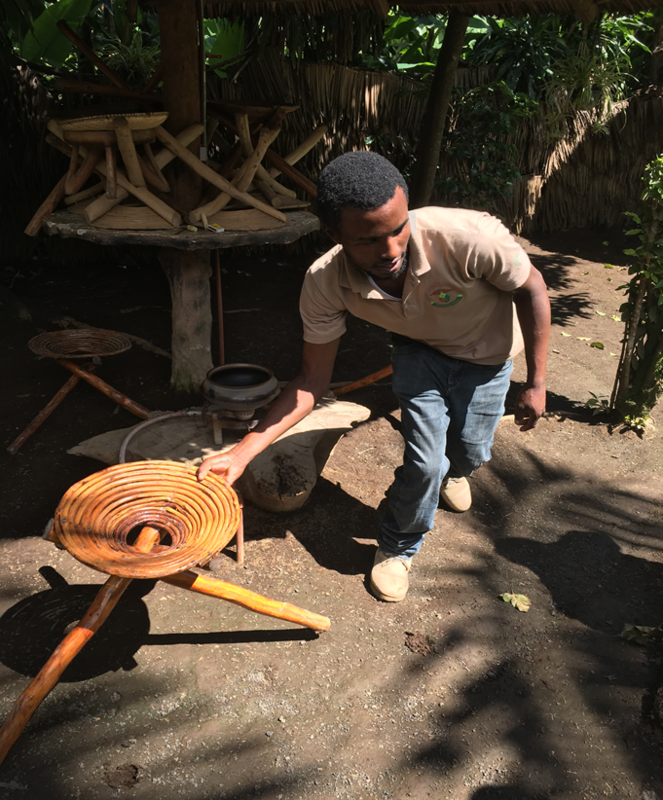 There are over 90 cultural tourism activities in Tanzania, each with a different experience. The Tengeru program is spearheaded by matriarch Mamma Gladness. She comes to greet you and you immediately feel welcome. Speaking Swahili and some English welcomes us and lets us know how important it is for us to be here and enjoy. We now enjoy ginger lemon grass tea, Tanzanian porridge. As we talk, we hear about the history of the area, the village and the people. We are told that in Tanzania the different tribes have a good relationship and work together. Elisante is quick to point out that this does not happen in other countries. Now it is time to begin our walk (kind of climb) up to the coffee plantation. As we, walk children coming out to look at us greet us. We do look a little different. Some happy to pose for a picture. We learn as we walk about the village, the crops that grow, how the village is sustainable in the practice they use and how important education is. We meet Bryson who is waiting for us half way up on our journey. He speaks English and Swahili and is very well spoken. He is a friend of EliSante and is looking after some younger children. He attends the local private school. The cost is $500 a year but you can tell he is going to be a leader. About three quarters of the way along, we meet a shopkeeper. He is a teacher as well. We get to chat and he told me I did not look my age, he is my new best friend. We finally reach the coffee plantation and learn about coffee. It is considered a 100-year cash crop. EliSante describes for us the process and the history of coffee. He also goes on to tell us that the father’s sell coffee and the mothers sell bananas as the primary income sources for families. Our journey down is a little easier but as it has been rainy a little slippery in spots. Donnie and Andrew are wonderful and keep an eye on me that I don’t slip. Once back at the village, we get to enjoy a wonderful buffet of local dishes. The food is simply delicious. Once we have eaten very well, we now get to complete our coffee training. We get to watch the process and hear the singing. It is awesome. Once roasted we get to enjoy and what a cup of coffee!! Our visit ends but I take with me wonderful memories and a better understanding of the people and the country I am fortunate to visit and work with even for a short time. Now the day has arrived to begin the work we have been asked to do. Excited to get started and a little nervous at the same time. Very glad to have Donnie’s experience to guide us. Arriving at the Arusha VETA, we see a modern college in a beautiful almost tropical setting. Getting there, you wonder if you are a little lost. You leave the main road to a dirt road that is very bumpy. Your journey takes you through fields where crops are growing and livestock is grazing. The all of a sudden you are there. Our classroom is in the hotel section of the school. So the course begins. We connect with our counterparts, who we will work with for the week. We are all eager to begin. Our students arrive and we step outside for a formal picture. Beginning our week, I was concerned that maybe our work might not translate and in particular had I done what I needed to do as a part of our team. Again, my colleagues really led the way and I felt very comfortable with what we had prepared and how we could adjust, as we needed. While each of us took a lead on certain topics, we all pitched in. 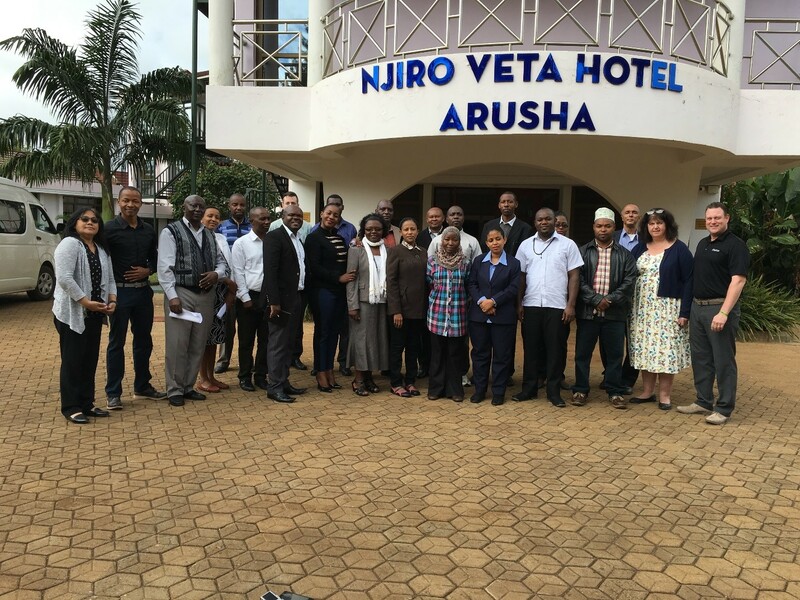 Our Arusha colleagues were equally a part of the delivery team. There were so many highlights of the week, too many to mention. However whenever I hear the bird dance, I will think of “Leading Change” and leading with Mary Nurse, the Bird Dance. Many laughs were had by all. Thanks Donnie for the music selection! For me other highlights were the building of marshmallow towers, the discussion groups with the women and men on bias and barriers in the workplace and most of all the lifelong friendships and memories. Too quickly are course was complete. Saying goodbye to a wonderful class was hard. The dedication and commitment of the students was so gratifying. Even harder was saying so long to such great colleagues. We enjoyed a wonderful bbq at the college with our new friends and colleagues. I think I learned more than I gave. As we left the college, we could see Mt. Meru in all its beauty. A picture I will always remember. I wrote earlier about the sunflowers. They are everywhere and while they are grown as a crop that produces sunflower oil, I will remember them for their bright yellow color against the lush green countryside. As you drive through the country, you see constant reminders of the resilience of people and the self-sufficiency. It is the small markets along the side of the road, people pushing carts carrying products and food for livestock or people working in a field and women transporting parcels on their heads. It is the Massai market in Arusha selling products and souvenirs and the women along the streets cooking Panir on a charcoal bbq. When I think of being entrepreneurial, I will now think of Tanzania and how much our communities can learn.